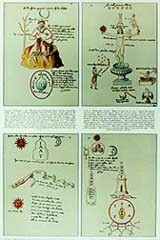 We have available for sale Symbolic Color Prints by J. Augustus Knapp (as commissioned by Manly Hall), Mihran K. Serailian and Select Buddhist Art acquired for the PRS Collection. 11” by 17” $7.00 each, unless otherwise noted. In a right-angled triangle, the square described on the hypotenuse is equal to the sum of the squares described on the other two sides. Which Plutarch described as revealing the Divine Trinity’s creative works. Abraxas—A “ word symbol” consisting of seven letters which signify the creative powers or planetary angels recognized by the ancients. 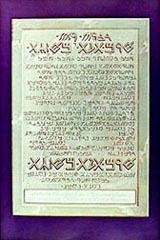 This plate is the enlargement and amplification of a Gnostic jewel, the original being only a trifle over an inch in height. Rings and other articles of jewelry were used by members of the order, a secret society, as means of identification, the designs were small and inconspicuous. In the Greater Holy Assembly it is written of the Ancient of Ancients that He is the Concealed of the Concealed Ones, the Eternal of the Eternal Ones, the Mystery of the Mysteries, and that in his symbols he is knowable and unknowable. He sits upon a throne of flaming light and the white light streaming from His head illumines four hundred thousand worlds. 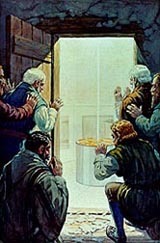 The glory of this light shall be given unto the just, who are called "the sacred fruits of the Tree of the Sephiroth." When queen Maya reached the Lumbini garden, she wished to stop there. As she stood holding a bough of a Sala tree, the throes of birth came upon her. The Bodhisattva appeared from the right side of the mother and was received at once by the gods and then by men. He came down from their hands, took seven steps and explained. 'I am the foremost of all. This is my last birth. I will cross the ocean of existence." 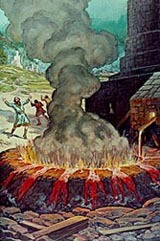 There is a strange Qabbalistic legend concerning CHiram to the effect that he was a descendant of Samael, the Spirit of Fire, and that among his ancestors was the immortal Tubal-cain, who invented the forge and first tempered metals…the masterpiece of CHiram’s handiwork was the Molten Sea—a magnificent laver of purification, carried by 12 oxen… thirty cubits in circumference. 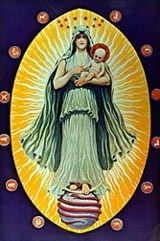 The Madonna who gives birth to the Man Child signifies the priority of the mother aspect of Divinity, the maternal creative function being considered the highest expression of being. The Christ Child symbolizes Wisdom; the Virgin Mother, Faith. The figure declares that Wisdom, born of Faith, shall redeem the world encircled by the serpent of evil. The cherubim described in Genesis signifies the clouds filled with phantomlike creatures which enveloped the Garden and hid it from view. Cherubim symbolize the fullness of wisdom and are the spiritual guardians of the four rivers of life flowing from the Creator. When the twelve tribes of Israel camped in the wilderness, the banners of Reuben (the man), Judah (the lion), Ephraim (the bull), and Dan (the Eagle) were placed at the four corners. 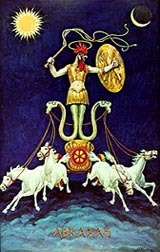 While the tripod and its base differ from the description of several authors, an attempt has been made to follow as closely as possible the symbolism concealed within the allegory of the oracle. The three legs symbolize the periods of time controlled by Apollo, the past, the present, and the future. So the Delphic Oracle, as the spiritual nature of man, is suspended over the abyss of oblivion by three golden threads of Divine power. 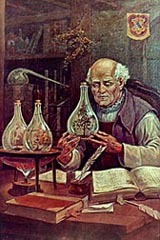 The great Rosicrucian, Robert Fludd, declared the universe to be a vast chemical laboratory and the various manifestations of life existing therein to be the result of alchemical processes analogous to evolution… The unfoldment of the Christ within each human soul is the magnum opus which elevates the philosopher to the exalted position of Father R. C., or a Knight of the Golden Stone. The Emblematic Cross symbolically depicts the forces awakened in the energy body of a fully initiated adept. 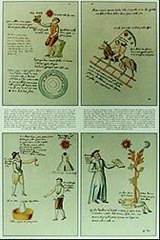 The harmony and equilibrium of their operation is represented by the four elements, the seven traditional planets, the twelve houses of the Zodiac, and the jewel in the rose at its center. In this picture the Dhyani-Buddha Mahavairocana is presented in the feminine form of Locani (Butsugan Butsubo). 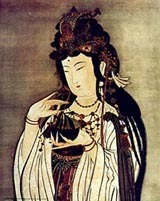 In this aspect is considered to be the mother of the Historical Buddha. 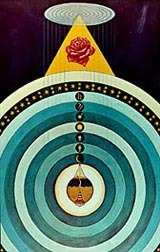 Locani is depicted crowned, seated on a lotus throne, which is placed in the midst of an open lotus. This flower has twenty-four petals arranged in three circles, each containing eight petals. 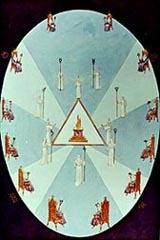 The inner circle has at the top Dainichi, accompanied by the seven star messengers. 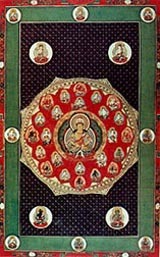 On the eight petals of the next circle are eight Bodhisattvas. 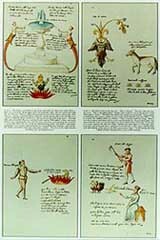 A grouping of western religions and the symbolic connections between them. To the left stands Mohammed, holding aloft pages from the Koran. At the lower right the Persian Sun God, Mithras. 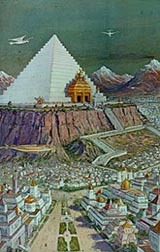 In the center stands the High Priest of Israel. 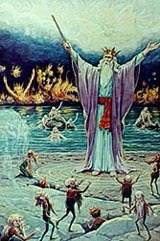 In the heavens above Jupiter Ammon appears the mystery of the Apocalypse. 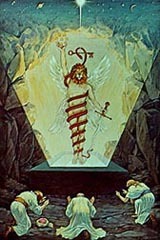 The four creatures of Ezekiel's Vision surround an alter upon which is the Book of Seven Seals and the Lamb of God. Double-sided—The Hermetic and Alchemical Figures of Claudius de Dominico Celentano Vallis Novi from a manuscript written and illuminated at Naples A.D. 1606. The candidate and his aged initiator shown standing on the brink of a chasm dividing the world of the living from the dead. Above the yawning cleft hovers the figure of Ceres, carrying the two torches which light her way through the gloom of the nether world. She pleads for the liberation of her daughter Persephone, whom Hades has abducted and would force to become his queen. Mephistopheles—the most notorious of the spirits of evil, is closely identified with the exploits of Dr. Faust. 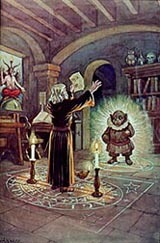 Goethe defines him as “part of the power that still works for good, while ever scheming for ill.” The majestic figure of the arch-tempter familiar to opera-goers is not the Mephistopheles of ceremonial magic, who rises from the invisible at the demand of the conjuror, limping into view as a grotesque dwarf, and woe to the unwary who falls under his control. 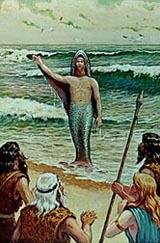 King Solomon carried aloft by the Ashmedai, king of the Shedds. In Japan the Dhyani-Bodhisattva Akasagarbha is venerated under the name of Kokuzo. This Bodhisattva represents the etheric matrix within which the material world exists. The fivefold manifestation of Kokuzo is said to represent the embodiment of five ancient Buddhas. 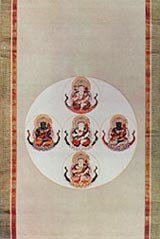 Akshobhya (bottom); Ratna-sambhava (left), Mahavairocana (top), Amitayus (center); Amoghasidhi (right). By yoga meditation the five vows associated with these figures will ennoble the character and discipline one's conduct. Bodhisattva of Mercy, and the Chinese Goddess of Compassion, Savior of the Afflicted and Protectress of Mortals. The twenty-fourth chapter of The Lotus Sutra is entitled "The All-sided One, Containing the Descriptions of the Transformations of Avalokitesvara." She has long received the homage of the devout seeking consolation for the tragedies of human existence. 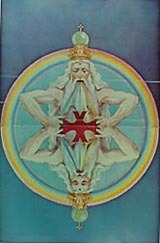 The double interlaced triangle of Solomon, represented by the two Ancients of the Qabbalah: the Macro-prosophus and the Micro-prosophus; the God of Light and the God of Reflection; Mercy and Vengeance. Out of the Sea of Eternity rises the Ancient and Holy One, whose inverted image is mirrored in the Deep. Thus the reflection of Deity is ever visible in Nature, but man mistakes the shadow for the substance. 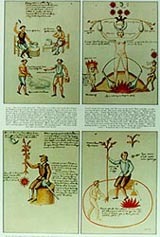 The magician, having drawn his circle, is here shown invoking the various elemental beings, who are emerging from their respective haunts. From the earth come gnomes, from the water undines, from the fire salamanders, and from the air sylphs. A strange wraith-like demon also answers the magician's call. In ridding Mecca of its idolatry, Mohammed accomplished the chief goal of his life. 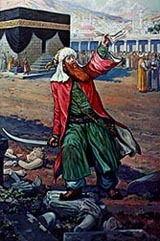 The homeless and persecuted refugee, once forced to cover the plot of ground where he prayed that he might not be stoned to death while performing his devotions, returned to the city of his birth as its conqueror. No authentic likeness of the Prophet is known to exist, since the very teachings of Islam are opposed to the perpetuation and deification of personalities. 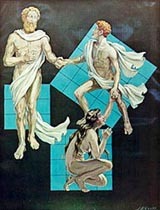 Hunahptu and Xbalanque, the heroes of the second book of the Popul Vuh, are here depicted undergoing the ordeal of the Bat House in the Mysteries of Xibalba. Camazotz, the Lord of the Bats, emerging suddenly from the gloom, strikes with his great sword at the intrepid invaders of his domain. The animal soul of man is sometimes pictured as a bat because, like this creature, it is blinded and deprived of its power by the light of the spiritual, or philosophic, sun. The ancient teacher of Babylon…whose whole body (according to Apollodorus) was that of a fish; that under the fish’s head he had another head, with feet also below, similar to those of a man, subjoined to the fish’s tail. This Being gave man an insight into letters and sciences, and arts of every kind; in short, he instructed them in everything which could tend to soften manners and humanize their lives. Also called Woden, Wodan, Wotan, Wuotan, and Odinn… As Woden therefore means both “wood” and “wisdom” it does not require a great stretch of the imagination to see in this symbolic name an allusion to the tree of knowledge growing in O-DON (E-DON, or Eden), the garden of wisdom. This painting of the head of Minerva shows the activities of the pineal gland & pituitary body at the time of the phenomenon commonly termed "the opening of the Third Eye." The Kundalini fire is seen rising upward through the spinal canal into the pons of the medulla oblongata. The golden light radiating from the base of the brain, at the back, gradually increases in size and intensity until it forms the nimbus, or halo, of the saint. When the Brethren of the Rose Cross entered the vault of their illustrious founder they discovered engraved upon the circular brass altar top this inscription: “A.C.R.C. I made this compendium of the universe as a sepulcher for myself alone.” The sacred book T found in the hand of Father C.R.C. closed with the following words: "We are born of God; in Jesus we die; and in the Holy Ghost we live again." 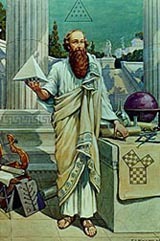 To the Stoics and Pythagoreans the term “palingenesis” was equivalent to metempsychosis or reincarnation. By reconstructing plants from their own ashes the alchemists sought to prove not only that consciousness and intelligence survive the annihilation of the physical structure, but they retain the individuality formerly possessed and remain as organized forces. In the great temple on Mount Salvat stands Parsifal, the third and last king of the Holy Grail, holding aloft the scintillating green Grail Cup and the sacred spear. Before Parsifal kneels Kundry, the temptress, who, released from the spell of the evil Klingsor, adores the sacred relics of the Passion. The great mysterious adept who termed himself the Comte de St.-Germain is generally supposed to have been born in 1710, but while the church register at Eckernforde contains a record of his death in 1784, he was seen upon several occasions subsequent to that date, having attended a Masonic conference in 1785 and in Venice in 1788. The last historical mention St.-Germain was in 1822, at which time he was on the eve of embarking for India. 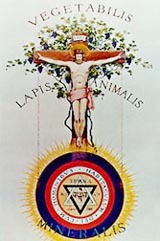 The Solar Crucifixion—an outstanding example of the astronomical knowledge possessed by the so-called prehistoric world—“…our solar system is located at the heart of the Divine Man of the skies.” Ignoring the crucifixion in the literal sense, the Gnostics considered only its cosmic import. The agony of the Savior is not the agony of death, but the agony of birth. Only to him who has found his life by losing it is the mystery comprehensible. 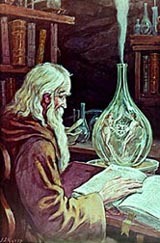 Father C.R.C (Christian Rosie Cross or Christian Rosencreutz)—considered not only as a personality, but also as a personification of the system of spiritual philosophy which he is reputed to have established—which explains why no authentic portrait of Father C.R.C. has ever been discovered. The Great Book of the Rose Cross lies unclasped upon the table, beside it an hour glass, intimating that in time all shall be revealed. “I, Isis, am all that has been, that is or shall be; no mortal man hath ever me unveiled. The fruit which I have brought forth is the “sun.” The face and form of Isis were covered by a veil of scarlet cloth, symbolic of ignorance and emotionalism standing between man and Truth. Isis lifts her veil and discovers herself to the true and wise investigator who unselfishly and humbly seeks to understand the mysteries which surround him in the universe; and warns Wise Men concerning the mysteries which they have seen: "If you know it, be silent." 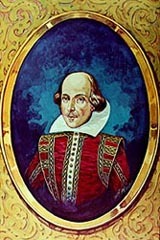 Redrawn from the Droeshout Portrait of Shakespere. The crudeness of the portrait, which has provoked adverse criticism from Shakesperian enthusiasts for over three centuries, appears to be an essential part of the scheme to mutilate beyond possibility of recognition the features of Lord Bacon. The opening lines of Ben Jonson's verse, To the Reader, are a cipher that reads: "This figure, that thou here seest put, F. Baco for gentle Shakespeare cut." A pictorial representation of the Kwan-Muryoju-kyo Sutra. 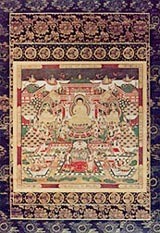 The present painting shows the central section of the Mandara and depicts the Western Paradise of the Buddha Amitabha. He is enthroned with the Bodhisattvas Avalokiteshvara (Kannon) and Mahastham-prapta (Dai-Seishi), in the midst of the glory of the Western Paradise. The central section is divided into five horizontal levels. The third level from the top contains the principal Buddha figures. The level directly below shows the pond of sacred lotus flowers. This concept is especially venerated by members of The Pure Land Sect. The Hiramic legend can be interpreted according to symbols in the ancient Mysteries, revealing assumes a philosophical exposition of the redemption of the human soul. The three Grand Masters become the Causal Triad posited as the triune foundation of existence. 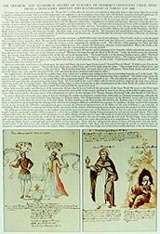 King Solomon (center), the one Eternal; King Hiram of Tyre (right), cosmic resources; CHiram Abiff (left), universal activity—the Dimiurgus. To the materialist the phenomenon of growth is a movement from within outward, for by this process form came into existence. To the philosopher, however, growth is a movement from without inward; not a contraction, but a directionalization of consciousness toward the center of being. 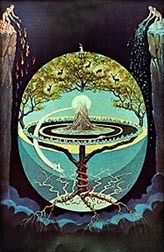 The Qabbalistic tree of organized manifestation is not only a macrocosmic symbol but also the emblem of man himself. In Ginnungagap, the great cleft in space, All-Father created the huge world ash tree—Yggdrasil—the symbol of Life, Time and Destiny. The three roots are called the spiritual, the terrestrial, and the infernal. The spiritual root has its source in Asgard, home of the gods; the terrestrial root has its source in Midgard, the abode of men; the infernal root has its source in Nifl-heim, the abode of the dead. Check here for our upcoming lectures and events at PRS.